Labels numerous locations throughout the region, including New York, Brooklyn, and Williamsburg. Sketch B. Showing the progress of Section No. 2. 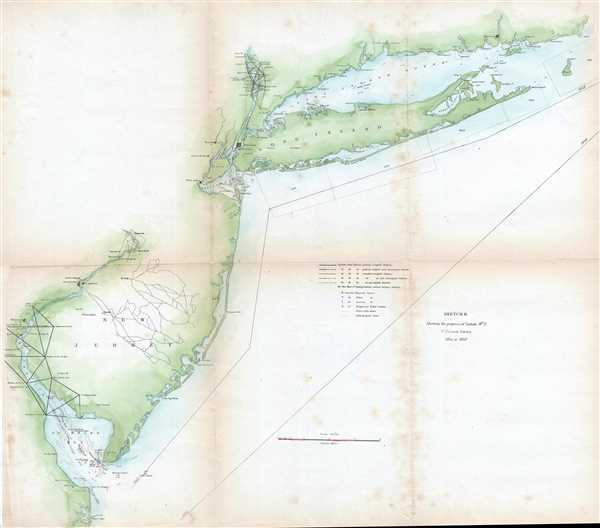 This is an 1850 United States Coast Survey triangulation chart or map of the Mid-Atlantic coast of the United States including all or part of the Delaware, New Jersey, New York, Connecticut, and Rhode Island coasts. The map depicts from Indian River Bay, Rehoboth Bay, and Cape Henlopen in Delaware through New Jersey, Long Island, and Long Island Sound to Block Island and Point Judith in Rhode Island. Created to illustrate the progress of the triangulation surveys in the region, detailed surveys are illustrated in the Hudson Valley and along the Delaware River. Several other sheets are noted through dotted boxes and are dated. Numerous cities throughout the region are labeled, including New York City, Brooklyn, Williamsburg, Flatbush, Newark, Philadelphia, Wilmington, New Haven, and New London. Other locations are labeled as well, such as Sag Harbor, Montauk Point, Jamaica Bay, Rockaway Beach, and Delaware Bay. This map was produced by the U.S. Coast Survey and included in the 1851 edition of the Report of the Superintendant of the United States Coast Survey. Report of the Superintendant of the United States Coast Survey, Washington, (1851 edition). Very good. Wear and toning along original fold lines. Backed on archival tissue for stability. Blank on verso.